I was also trying to post more content for my site. You may notice that I normally have at least two posts and one video each month. Now I plan to post four times per month, plus one cooking video at end of month, may also post a short travel video clip in middle of month too. Well, this will need a lot discipline though, but I will try. 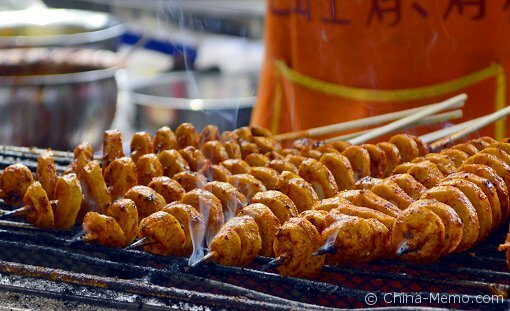 Ok, here is one picture from my new post for China Xian Muslim street, grilled wheat gluten, tastes good, love it. (Click the image will open a new window for this new post). This is about my journey for China Xian two day DIY, visited Xian Drum Tower, Huifang Style Street (Muslim Street), City Wall, Dayan Pagoda North Square and Terra-Cotta Warriors. I don't know if you are into travel, but maybe interested to see some famous places in this ancient capital Xian? then have a look. This post is a summary of my trip, will have more details in the future. Xian Muslim Street is a famous food street in Xian, a must visit place for food lovers. It is all about the Shanxi local specialized food, different types of noodles, pancakes, candies and cakes. I feel it is a perfect place to experience Xian local life and food culture. Lots pictures, but can't share in one post, so will post more next time.